The venture will be called Alliance Rostec Auto BV and following a $742 million investment by Renault-Nissan they will possess 67.13 percent of the firm by mid-2014, as well as holding a 74.5 percent stake in AVTOVAZ. 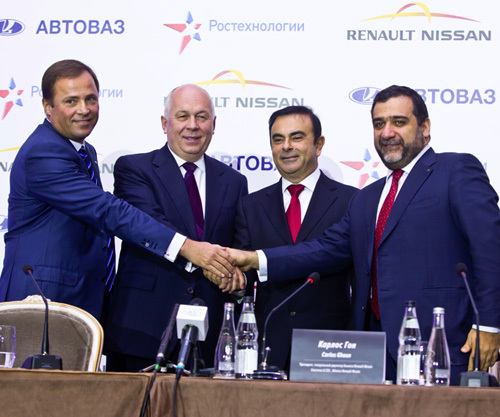 Renault-Nissan Chairman and CEO Carlos Ghosn announced the operating agreement today at a ceremony in Moscow, with Sergey Chemezov, General Director of Russian Technologies and Chairman of the Board of AVTOVAZ, and Igor Komarov, President of AVTOVAZ, in attendance. “Today's historic agreement is a win-win-win for all companies – Renault, Nissan and AVTOVAZ,” Ghosn said. “It is a significant new chapter in an already solid partnership. The joint venture will help accelerate our Russian market offensive. It will support the competitiveness of AVTOVAZ, Russia's auto industry leader." Renault purchased 25 percent of AVTOVAZ back in 2008, helping the firm to successfully turn around the business. The company will invest another billion $366 million in 2014, planning to own 50.1 percent of the joint venture. In addition, Nissan, with no previous stake in AVTOVAZ, will chip in $376 million garnering its own 17.03 percent of the business entity, during the same period. To facilitate the joint venture, Russian Technologies is restructuring outstanding loans with AVTOVAZ totaling $258 million using proceeds from the sale of the Russian carmakers nonessential assets to repay Russian Technologies loans. As part of the deal Renault-Nissan Chairman and CEO Carlos Ghosn will be Chairman of the Board for Alliance Rostec Auto BV. The remaining members of the Board of Directors will consist of Dominique Thormann, Executive Vice President and Chief Financial Officer, Renault; Joseph Peter, Executive Vice President and Chief Financial Officer, Nissan; and Bruno Ancelin, Senior Vice President and Chairman Eurasia Region, Renault. In the picture above are, from left to right, Igor Komarov, President of AVTOVAZ; Sergey Chemezov, General Director of Russian Technologies and Chairman of the Board of AVTOVAZ; Carlos Ghosn, Chairman & CEO of the Renault-Nissan Alliance and Ruben Vardanian, Chairman of the Board of Directors and CEO of the Troika Dialog Group. The three members from Renault Nissan are to be joined by Sergey Chemezov, General Director, and Igor Zavyalov, Deputy General Director, from Russian Technologies. Three more representatives from AUTOVAZ and the Troika Dialog Group, the current majority owner of the Russian automaker, will complete the board. The board AVTOVAZ will be expanded to15 members from 12. These candidates will seek approval at an extra AVTOVAZ shareholder meeting next February 12. Sergey Chemezov will remain Chairman of the Board of AVTOVAZ and will alternate with Carlos Ghosn as Vice Chairman beginning June 2013. The deal follows the efforts of Vladimir Putin, President of the Russian Federation,to create an auto fabrication facility capable of producing 350,000 vehicles per year in Russia’s Samara region eight years ago. This site will become one of the largest platform-sharing programs in the Renault-Nissan Alliance, having already started production on the LADA Largus last spring 2012 and launching the new Nissan Almera yesterday, expecting to be at full production by next spring. The plant’s production will soon consist of five models and three brands – LADA, Renault and Nissan. The joint venture will also have fabrication sites in Moscow, St. Petersburg and Izhevsk, all of which will benefit from the new projects and investments, giving the combined automakers a total capacity of 1.7 million vehicles per year by 2016. Last year, Russia produced 2.65 million vehicles including light commercial trucks. This year the volume is expected to jump up to 2.9 million units. Renault-Nissan Alliance is the third largest carmaker in Russia, producing 878,990 cars last year, including 578,387 LADAs, giving the group nearly a third of the market.